This delightful story-within-a-story is filled with good-natured sibling rivalry, and focuses on the spirit of cooperation, the satisfaction of a job well-done, and the magic of storytelling. Features Read-Aloud/Read-to-Me functionality where available. Violet and Victor Small are twins on a mission: to write the best book in the whole, entire world--together! Victor is reluctant, but Violet is determined, and soon the ideas can't come quickly enough. They begin to write a story about a hungry Bookworm who is eating all the books in the library. 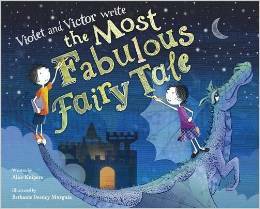 Thanks to Victor's brilliant ideas, Violet is able to save the day (and the library). I picked this fun story up to help motivate my oldest (8 at the time) to write her stories down. She has all these amazing storylines she keeps coming up with and tells me these elaborate tales but then I can't seem to manage to convince her that she needs to write them down so she won't forget them, because of course she will always remember everything, haha. Anyhow, I thought this would be a great book to give her the idea of taking all that she imagines and creating her own books. I also loved the idea of it showing two siblings working together but still maintaining their own identities...which of course in the end only makes things that much better. Violet has decided that she wants to write a story but she needs Victor her twin brothers help as he has such good ideas, but Victor wants to count his worms. Together they set pout on an adventure through their imaginations to write the best book they can together. I loved how these two very different (yet similar as they are twins) siblings come together to find a common ground, how Violet learns that writing a book is no small or easy matter and that working together can work out perfectly. The Illustrations in this book are fantastic, so bright and cheerful. I love how it is a mix of mediums, photography, back and white drawings, and colorful pictures. I also appreciated how they used colored text boxes to help distinguish between Violet and Victors commentary. My only complaint would be that it can get a little confusing between the two characters voices for younger listeners. If you are reading this out to a class you will want to be sure to keep distinct voices for the two characters and/or make sure your listeners know that the words are 'color-coded'. I think this is a fantastic fun book for any little bookworms in your life and especially handy for elementary teachers who might be teaching a story writing block. It is a bit long for the younger (preschoolers) crowd, but the illustrations will really pull them into the story. This is a really enjoyable read that I know any book lover out there will want to check out. I find something new in the illustrations every time I read it to my girls and I am really thrilled to know that there is sequel, Violet and Victor Write the Most Fabulous Fairy Tale...it's too easy to fall in love with Violet and Victor Small and I can see many adventures in their future and ours! I was born in London, England, and I moved to Canada in 2003 when I fell in love with a Canadian. We live in Saskatoon, Saskatchewan, which took a while for me to learn how to spell. I have three children, a girl and two boys. My first novel, Life on the Refrigerator Door, was published in 28 countries, won several awards and was named as a New York Times book for the Teen Age. 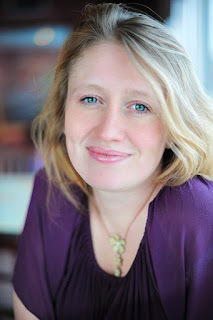 My second is called Lost For Words in the US, and The Worst Thing She Ever Did everywhere else. It won the Arthur Ellis Award, was shortlisted for the White Pine and Willow Awards, and was published in eight territories. 40 Things I Want To Tell You is the YA book I published in 2012. My newest novel for young adults is called The Death of Us. 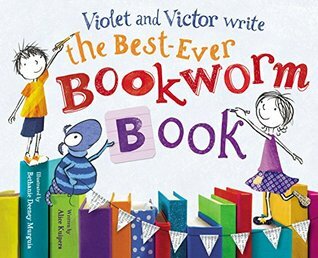 The Best-Ever Bookworm Book by Violet and Victor Small is my first picture book. It will be published with Little, Brown Books For Young Readers in December 2014, and a sequel will follow.